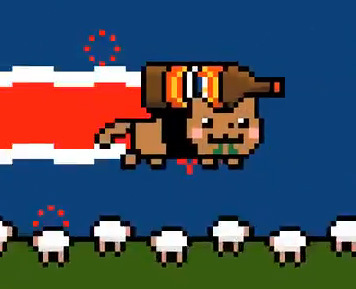 Nyan Cat isn’t a new meme, but it has just recieved a delightfully Kiwi twist. For those of you who don’t often visit the meme-world, Nyan cat is pretty much just a cat, made of pop tarts, racing across the sky, leaving rainbow trails. That’s it. Seriously, that’s it. And it’s annoying, and it’s addictive. And now, a New Zealand version! Featuring a version of Dave Dobbyn’s Slice of Heaven, here is Kiwi Nyan Cat! If my animation skills were better I would stick your face on it and make a Nyan Cate. That would make my life complete. I’m not even teasing.